SUMMARY: Observations of a scientist couple on the dog’s evolution. Also touches on training and sports. AUDIENCE: A little too technical to be read for entertainment purposes without being rigorous enough to be used quotable in mainstream academia. Perhaps the person who will enjoy it the most is the scientifically literate owner with a speculative bend. REVIEW: I am a little torn on this one. This book is widely quoted by respectable sources, yet I find it lacking A LITTLE in structure and scientific rigour. Given the authors’ academic background, I presume this is more the result of a marketing decision than a lack of skill. I found the choice to devote so much space to dog sleighing surprising – and a little frustrating (I am not all that interested in dog sports). Ray Coppinger has a lot of expertise on the subject, but the focus on sports was disproportionate in a generic book about dogs. The most valuable part of this book is, without doubt, is the Coppingers’ thought-provoking discussions on the evolution and origin of the dog, explaining their trademark “Pinocchio” hypothesis in their own words. 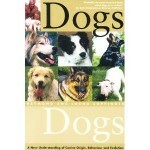 The Coppingers’ theory on the origin of the dogs is frequently quoted, and deservedly so in my opinion. Ray Coppinger seems disparaging of dog trainers focus on conditioning theory, but I did not understand the nature of his reservations, nor did he engage me to think of alternatives. A point worth exploring, certainly. I am glad I read it, but I see it more as a must-read in the most literal meaning of the word – it WILL be in a compulsory reading list if you are studying dogs. So, I did not particularly enjoy it, but, as it is quoted so often, it would have been unprofessional not to read it. Browse the Book Review archive. Genre: pop science. Book Authors: Coppinger Lorna, Coppinger Ray. Reading Level: Owners. Star: 3. Bookmark the permalink. Post a comment or leave a trackback: Trackback URL.